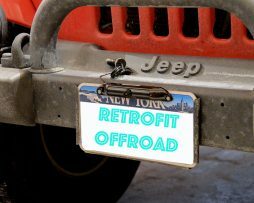 Retrofit Offroad’s TrailVision system is designed specifically for Jeep and off-road use, with features not generally available in other camera systems. TrailVision has been thoroughly tested and proven in Moab and Colorado. 1) The Base/DIY System is the foundation of all TrailVision installations, allowing custom camera selection for enthusiasts who are looking to experiment. 2) For a proven all-in-one package, the Complete TrailVision System includes our off-road tested and proven cameras, camera mounts, and accessories. • Quad View 7″ LCD Color Monitor supports up to four (4) cameras. • Monitor includes DVR capabilities and allows for quickly changing out standard SD Cards up to 32GB each. Record all of your off-road adventures! • Monitor even works well at night, with back-lit buttons and automatic screen dimming. • Advanced features simplify trail driving. “Triggers” let you switch cameras without taking your hands off the wheel. • Small, lightweight cameras are easy to mount with no drilling or zip-tying cameras in place. • Cameras are easily removable without having to uninstall most of the wiring. • Wiring is simple and integrates easily with the Jeep. No hacks required. • Several different styles of camera mounts are all designed for easy mounting. • Clear step-by-step documentation (40+ pages) empowers any Jeep owner to successfully install the entire system in an afternoon. Don’t have a spotter? Would you feel better knowing they’re not missing something? Are you constantly getting in and out of the Jeep to check clearance, tire placement, etc? Our TrailVision system is designed to give you the flexibility to capture any angle and viewpoint you desire. Especially important on those trips when you don’t have a good spotter, our TrailVision system has you covered. Eliminate blind spots with up to four (4) cameras placed strategically around your Jeep. And our Trigger system is a unique feature in our TrailVision System that enables you to easily switch from one camera to the next without having to move your hands from the steering wheel. Worried about installation? Our clear and informative installation and operations manual will put your mind at ease. This system can easily be installed in an afternoon. We provide step-by-step instructions for installing and wiring the system in a Jeep TJ Wrangler or JK Wrangler, and they are easily adapted to other vehicles. Click below for detailed information about each system. 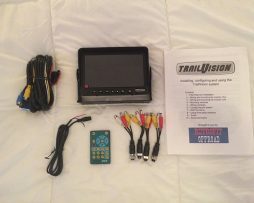 This System is the foundation for all TrailVision installations. Start with this system, and either add your own cameras and accessories, or buy guaranteed-compatible cameras and other accessories from us to build your ideal system. The Base System/DIY System includes a very detailed 40+ page installation and operations manual which provides step-by-step instructions for installing and wiring the system in a Jeep JK or TJ. The 7″ LCD monitor can display up to 4 cameras at one time, and includes DVR capability and advanced features such as triggers and audio inputs/recording. Also includes a multifunction remote control, and wiring and power adapters for 4 cameras. 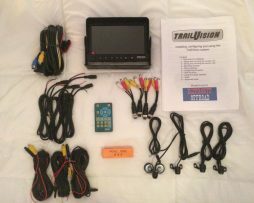 TrailVision Offroad Jeep Camera System A includes everything offered in our Base System/DIY System, but includes our Trail Tested and proven cameras, camera mounts, wiring and 40+ page installation and operations manual. Detailed 40+ page installation and operations manual which provides step-by-step instructions for installing and wiring the system in a Jeep JK or Jeep TJ. The TrailVision 7″ monitor can display up to 4 cameras at one time, and includes DVR capability and advanced features such as triggers and audio inputs/recording. Wiring and power adapters for 4 cameras. 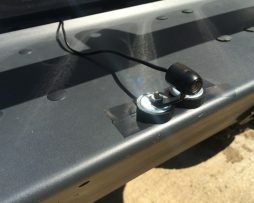 1 – TrailVision License Plate Camera with 16ft of camera cable. 3 – TrailVision camera mounts and magnetic mounts for Bullet Cameras. 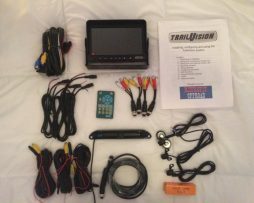 TrailVision System B includes everything offered in our Base System/DIY System, but includes our Trail Tested and proven cameras, camera mounts, wiring and 40+ page installation and operations manual. Detailed 40+ page installation and operations manual which provides step-by-step instructions for installing and wiring the system in a Jeep JK or TJ. 4 – TrailVision camera mounts and magnetic mounts for Bullet Cameras. 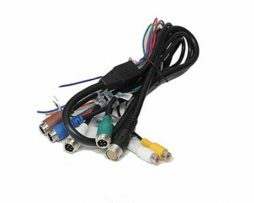 This TrailVision Monitor/DVR Wiring Harness is included in all the TrailVision systems (Base System, System A, and System B), but is also offered seperately so you can use your system in a second vehicle without having to remove the monitor wiring. All TrailVision Systems come with a screw-mount u-bracket monitor mount, but you may decide that a different mount is best for your situation. The Double Swivel Mount Screw-in base. 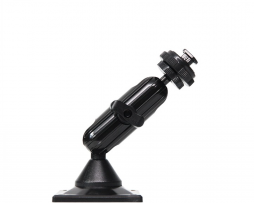 With double swivel heads, this mount allows for phenomenal flexibility. Its secure base screws into the dash or ceiling and its flexibility allows the monitor to mount in the best position for viewing. This mount also works with the Rugged Ridge dash top for the 2007-2010 Wrangler with device mounting ball. All TrailVision Systems come with a screw-mount u-bracket monitor mount, but you may decide that a different mount is best for your situation. 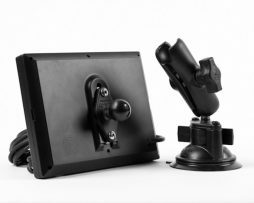 This Windshield Suction Cup Monitor Mount is designed to work with our TrailVision Monitor and allows you to place the monitor anywhere that you would like on the windshield.